The federal government will no longer fund or provide armored vehicles that run on a tracked system instead of wheels, weaponized aircraft or vehicles, firearms or ammunition of .50-caliber or higher, grenade launchers, bayonets or camouflage uniforms. 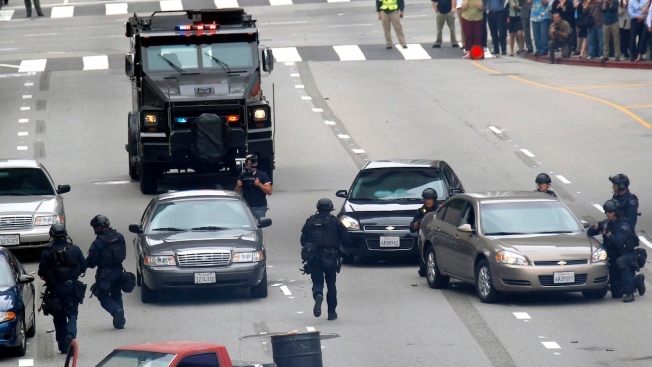 In this June 6, 2013 file photo, Los Angeles police take part in a downtown counterterrorism drill. President Obama on Monday will ban the federal provision of some types of military-style equipment to local police departments and sharply restrict the availability of others. President Barack Obama ended long-running federal transfers of some combat-style gear to local law enforcement on Monday in an attempt to ease tensions between police and minority communities, saying equipment made for the battlefield should not be a tool of American criminal justice. Grenade launchers, bayonets, tracked armored vehicles, weaponized aircraft and vehicles, firearms and ammunition of .50-caliber or higher will no longer be provided to state and local police agencies by the federal government under Obama's order. "We've seen how militarized gear can sometimes give people a feeling like there's an occupying force, as opposed to a force that's part of the community that's protecting them and serving them," Obama said, nine months after an outcry over the use of riot gear and armored vehicles by police confronting protesters in Ferguson, Missouri. "It can alienate and intimidate local residents and send the wrong message," he said. Obama made his announcement in Camden, New Jersey, where he praised efforts by the police department to improve their relationship with a poor community struggling with violence. With police under increased scrutiny over highly publicized deaths of black suspects nationwide, Obama also unveiled the final report of a task force he created to help build confidence between police and minority communities. And he issued a broader appeal for Americans to address the needs of poor communities and racial disparities before they erupt into disorder. "If we as a society aren't willing to deal honestly with issues of race then we can't just expect police departments to solve these problems," he said. He also reiterated his call for overhauling sentencing practices for nonviolent drug crimes. "We can't ask the police to be the ones to solve the problem when there are no able-bodied men in the community or kids are growing up without intact households," he said.